We wish we could stuff ourselves on their pasta and pizza every day. 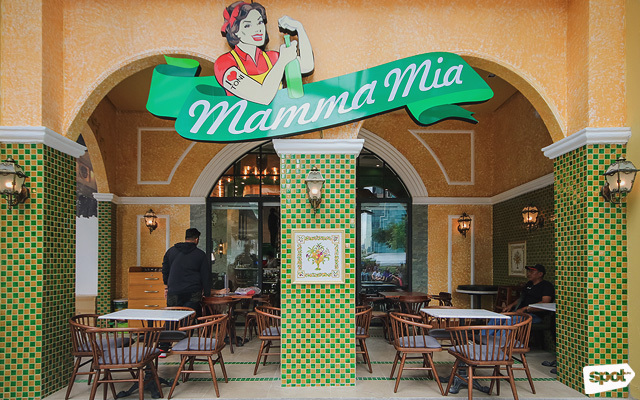 (SPOT.ph) If transporting you to Italy is one of Mamma Mia’s goals, then they’ve succeeded right from the get-go. 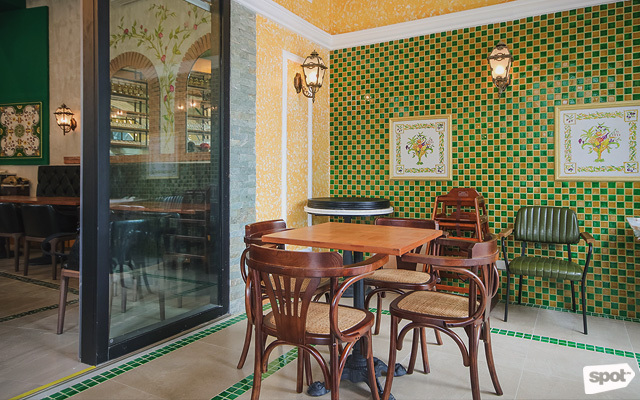 From the mosaic tiles, the high arches leading inside, to the plates and other colorful knickknacks hanging on the rustic brick walls, the space channels the villa from Under The Tuscan Sun all throughout. 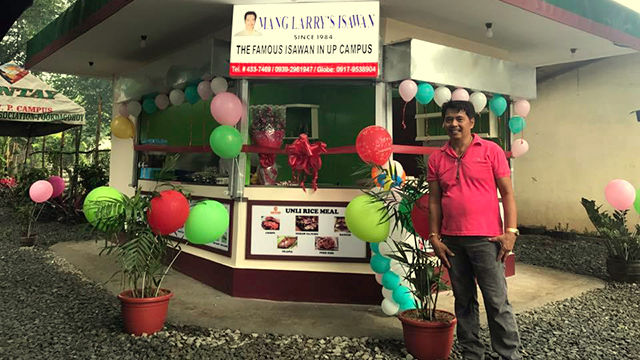 We can almost imagine an Italian family throwing an elaborate wedding feast here, with dancing and all. 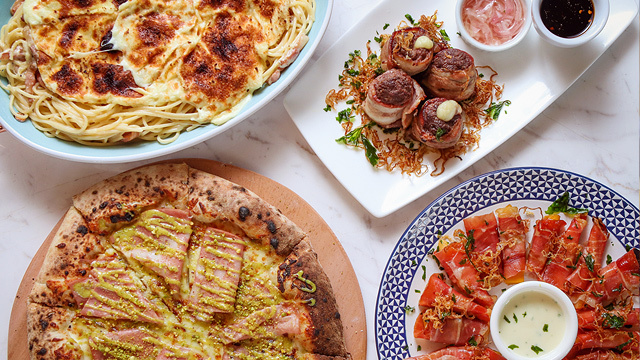 If ordering gets a little too overwhelming, you can do as the Romans (and the rest of Italy) do and start with an antipasti. 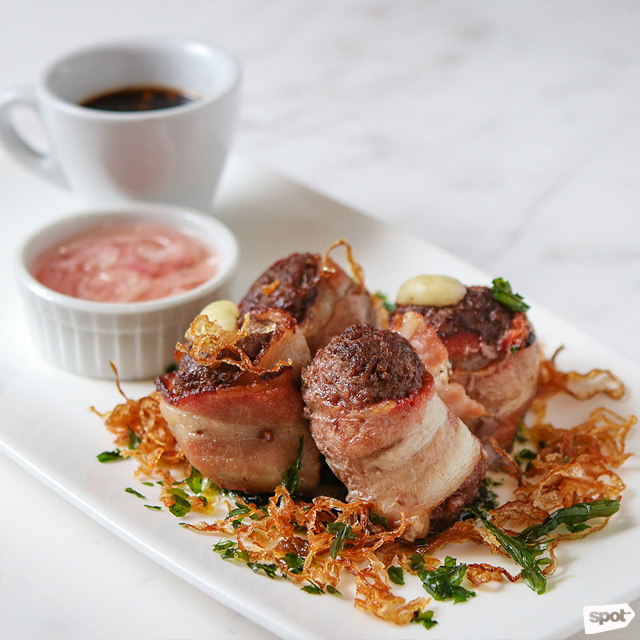 They weren’t kidding when they named the Italian Bacon & Meatballs Bomb (P375) because these bites explode with an intense smokiness that verges on peppery. 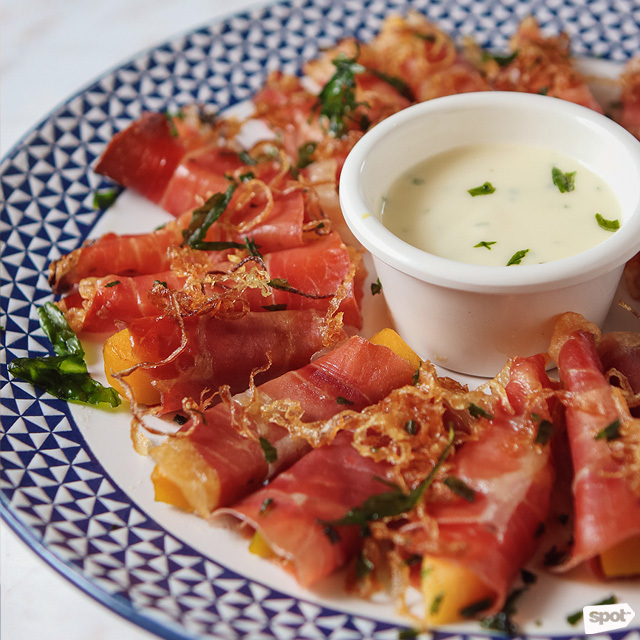 The flavors of the Melon and Pumpkin Wrapped With Prosciutto Al Forno (P375) are relatively milder in comparison, but that’s not a point against it. Not when you have an enjoyable contrast between refreshing melon and pumpkin against the saline of the prosciutto. Dunk everything in the tangy yogurt dip, and you’ve got yourself an addicting antipasti you’ll polish off in minutes. What makes this carbonara extra special is a heaping pile of melted parmesan cheese loaded on top of the dish. 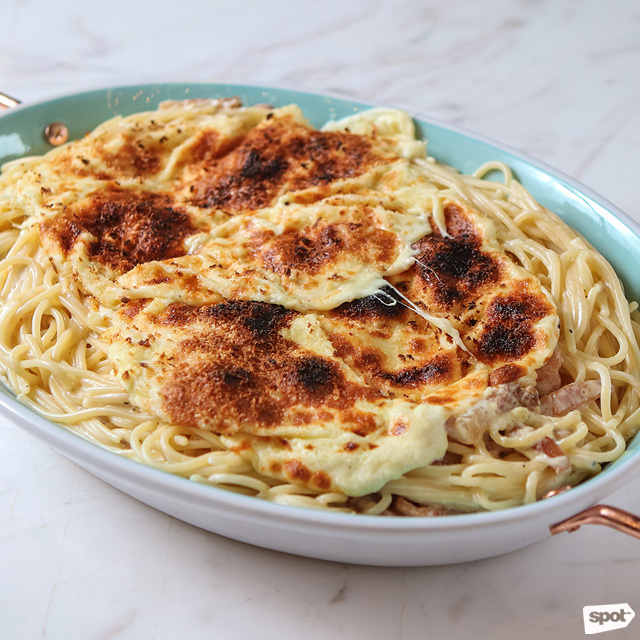 The gooey cheese gives the creamy carbonara (made with eggs instead of cream, like a true Italian would) extra richness, and the slightly charred top adds an extra smoky crunch that mixes up each bite. And as if that’s not tasty enough, you also get thick chunks of savory pancetta tossed in the mix. 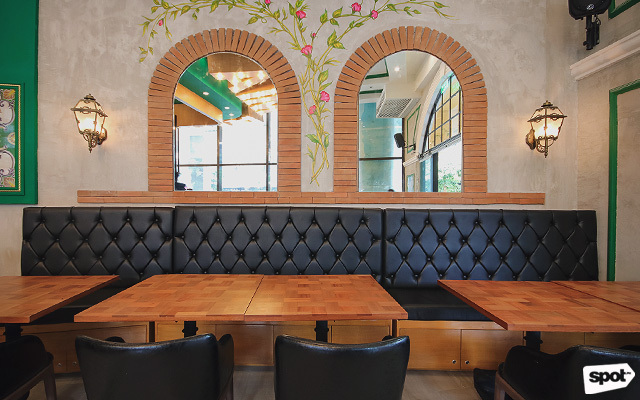 Of course, no Italian restaurant is complete without pizza—we’d even go so far as to say they should be judged by it. 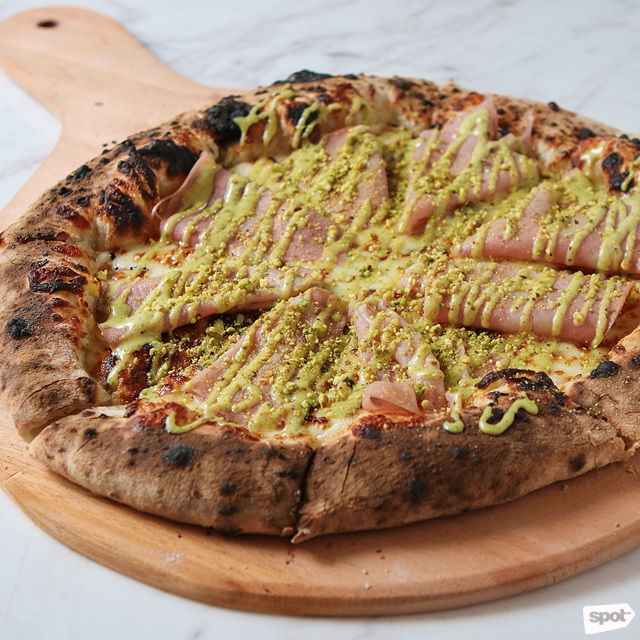 Luckily for Mamma Mia, their Mortadella e Pistachio (P595) passes with flying colors. 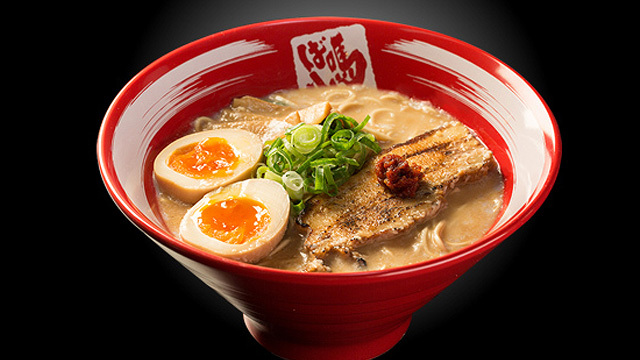 The crust is chewy, with the distinct smokiness only being baked in a wood-fire oven can provide. But what’ll make you fall in love with it is the stuffed edge, filled with a blend of Taleggio, Mozzarella, Cream Cheese, and Mascarpone. The creaminess and subtle sweetness of the cheeses is the perfect finish to a slice packed with the punchy flavors of smoky mortadella (or Italian luncheon meat) and the earthy and nutty pistachio bits. Or you could always eat this pizza crust-first. We won’t judge.